The ‘swish of skirt’ means that mothers are getting overly involved in the schooling for their children. During the 1980s swish of skirt phenomena was serious social problem in Korea. Some mothers move into areas concentrated with of private academic educational institutions such as Gang Nam School District 8. Also the expensive private lessons were prevalent in that area so Korean government conducted crackdown people who were related to those expensive private lessons. Mothers in 1980s, they thought that entering their children to good university (SKY, Seoul University, Korea University, Yonsei University) is their goal and duty as mothers because mothers believed that qualification (especially graduating a good university) determines their children’s lives. Mothers (ajummas) waited and prayed for their children to pass a university entrance examination withough leaving while students were taking the exam. This education fever of South Korean mothers was continuously overheated to make their children entering the good universities. Thus, Korea stands the first regarding domestic expenses on education in the world. Since 1980s, women in Korea playing both roles, “professional mother” and “professional housewives”. They are like a superwomen. 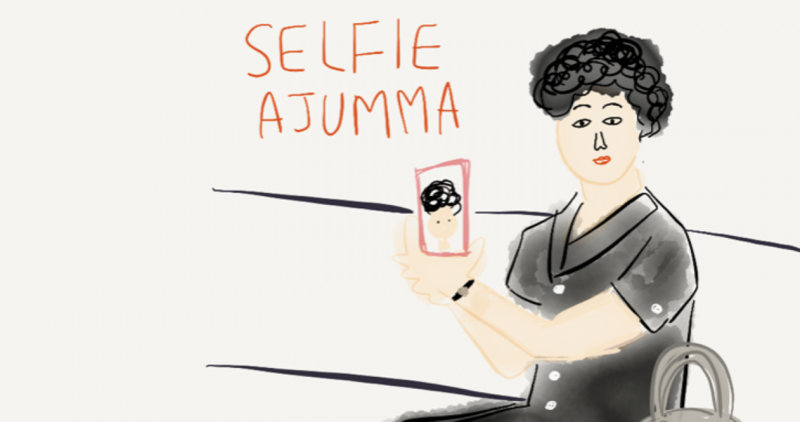 As I mentioned before, ajummas are superwomen. We still have education fever and ajummas of course still concern their children’s education. For example, there are Helicopter mothers and Kangaroo mothers. They are overly involved into not only their children’s education, but also their private lives (e.g. hobby, a network of friends, jobs and even marriage). But I think the way of ‘swish of skirt’ changes into sort of ‘digital swish of skirt’ in these days. In other words, mothers (ajummas) in these days became smart for their children’s education. This means that many of ajummas (mothers) use their smartphones to search information and useful sources for their children’s education. I will talk about ‘Digital swish of skirt’ in next post. Posted on 13 Jan 2016 13 Jan 2016 by moon ajummaPosted in Smart Ajumma (English)Tagged 1980s, ajumma, digital swish of skirt, education fever, Helicopter mom, 아줌마, Kangaroo mom, Korean mothers, Korean women, swish of skirt.